Tactical poly resin spike with knurled handle. Non-metallic, lightweight, yet strong enough to punch through plywood. Non-metallic, resin spike or dart with knurled handle, 3- sided point and lanyard hole. 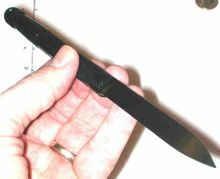 Many uses for this tough, rigid, self defense tool, such as a kubaton or spear point implement. Capable of being struck through plywood. Dimensions: 8 inches long, 1/2 inch in diameter. Weighs 0.8 oz. Can also use as a tent peg, marking stake etc. Always great products, shipping, price and service. Thank you very much. Great item, got here fast.